'Doctor Who': Is The Doctor Actually Banksy? This weekend’s episode of “Doctor Who” included some solemn social commentary, as the Doctor and her companions landed in 1960s Alabama on the day that Rosa Parks refused to give up her seat at the front of a segregated bus. The Doctor, always hungering for justice, ruminates on the oppression of Jim Crow, while Ryan and Yasmin endure discrimination that, while horrible, isn’t entirely unlike what they faced in 2018 London. 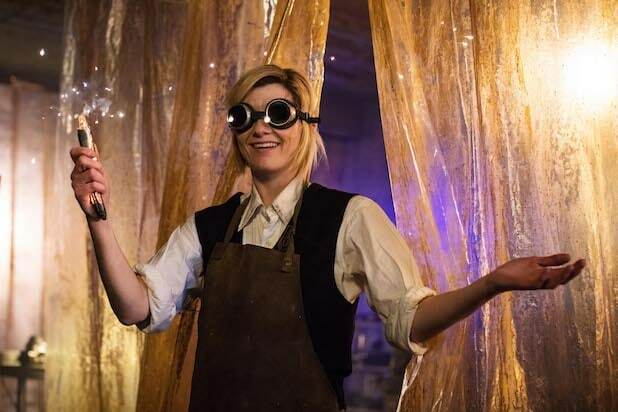 Of course, this is still “Doctor Who,” and even amidst the prejudice and the attempts by a cosmic villain to interfere with civil rights history, the Doctor still has time for some silly jokes, including suggesting that she is the notorious street artist Banksy. Early in the episode, the Doctor is spray painting on the side of a motel when her companion Graham calls her out. Of course, the Whovians loved the scene. Honestly though, The Doctor winding Graham up about being Banksy was fantastic. “Doctor Who” airs Sundays on BBC One and BBC America.